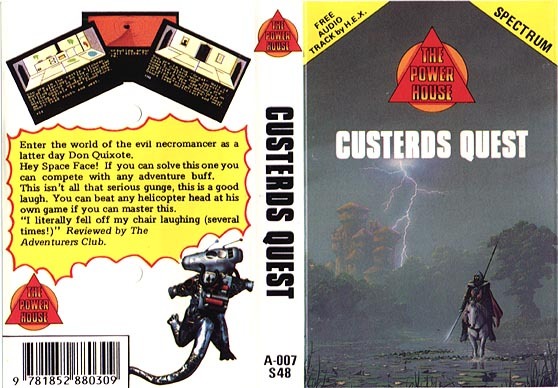 Remarks The Adventureland website reports: "There were in fact, 2 versions of "Custerds Quest". The first, written in the Summer of 1986, was accepted and released by Alpha Omega, the then budget arm of the software company CRL. Half a year later, AO relaunched themselves as the Power House, and relaunched their games with new packaging. Craig Davies took the opportunity to revise "Custerd", using the Quill's text compressor (The Press) which had been released in the meantime. The Power House version thus contained about 10k more text, and is the superior." Comes with a free audio track by H.E.X.